Michelangelo claimed it was his job to free the sculpture that is trapped in a piece of marble. The same idea I get whenever I drink a young, fruit-packed wine that still hides the minerality, complexity and finesse that within seven years will make it a true vin de terroir. It is easy to talk about the virtues of cellaring (and waiting), but at the same time these wines give a sensuous, undemanding and disarming delight. 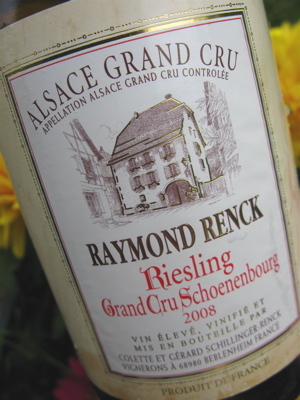 2008 Riesling Grand Cru Schoenenbourg from Raymond Renck in Beblenheim has a deep greenish-yellow colour. The wine smells of luke warm apple pie, lemon and a little chocolate. The taste is fruit-driven with a complete mid-palate and a fine structure with Schoenenbourgs obvious minerality and grapefruit-like structure. Yummy! Price: € 10.